I cannot believe it. I thought that I would never see it again. Those have that read my TTM reports on here know that I'm pretty strict about only mailing cards, because it's "eh, whatever" if I never see them again. This was the first time I ever mailed out a piece that wasn't a card, and a piece that was one of my favorite pieces in my Jags collection, but I took the chance. This took about 3 1/2 weeks to get back to me, which is nothing at all. He used the blue sharpie that I included in the envelope, and personalized it. I didn't ask for it to be personalized, but it doesn't bother me at all, since he's the only one that will sign it... and unlike those I've sent blue sharpies to in the past, he actually put it back in the envelope. 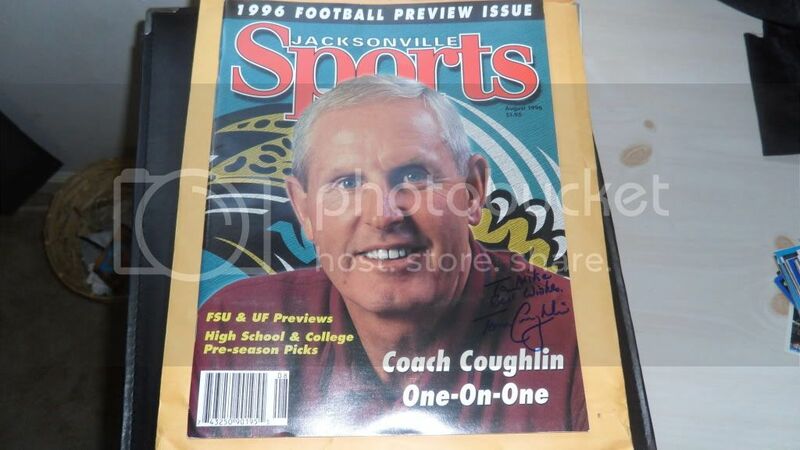 "A Tom Coughlin used Sharpie. HCIT? :howcoolisthat: "
I'm pumped that I got this back. I'm going to get it framed tomorrow.